In most metropolitan cities, five dollars won’t get you much. A mug of a fancy coffee drink, perhaps. Or a moderately- priced cocktail. Perhaps even admission to a museum or a snack for the road. In Phnom Penh, however, a five dollar note goes a mighty long way. 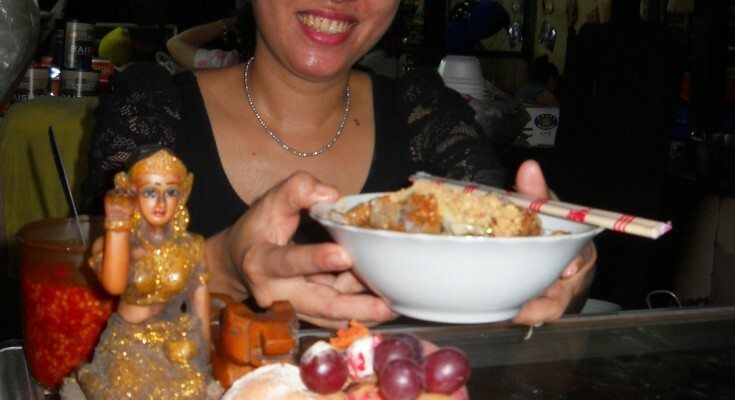 You can even get by for an entire day, if you stick to local places and skirt around most of the expat hangouts. Breakfast at Central Market (less than $1 for a bowl of rice and pork or baguette and noodles). Lunch at Russian Market ($1 for a heaping bowl of cold, tasty noodles covered with chopped spring rolls or a plate of steaming-hot, delicious savory chive cakes with a glass of freshly-squeezed orange juice). Moto from Central to Russian Market: $1 (or a 40-minute walk to save the dollar). Dinner at Chinese Noodle House or Lian Rong Dumpling Hall (both on Monivong) or Dosa House near Wat Lanka: $1.50 for many of the main dishes on the menu. And add a cup of Vietnamese coffee from a sidewalk stand for an additional 50 cents along the way. If you’re not planning on living on five dollars for the entire day, there are plenty of things to do around the city with the same amount. Visit the National Museum on the riverfront. It’s a gorgeous building where you can linger for hours looking at more than 5,000 objects including Angkorian statues and Asian artifacts for the $3 admission fee. Housed in an open Cambodian style structure with a leafy courtyard in the centre, it’s a great place to take a book, soak up the atmosphere and spend much of the day. At the north end of town, Wat Phnom is a large and beautiful wat (pagoda) which marks the founding place of Phnom Penh. There’s a fee of $1 for foreigners to visit but you can spend hours sitting in the lush grounds, exploring the sanctuary, watching Sambo the elephant and dodging the monkeys bounding around the park. It’s not really “recreation” but Tuol Sleng Genocide Museum is a significant place worth visiting for an insight into the history and resilience of Cambodian people. Admission is $2 and you can pay a couple of additional dollars for a guide. If you’re not in the mood for cycling or walking around town, let someone else do the work. Cyclo and tuktuk drivers are everywhere you look (they will find you) and, for $2-$3 a trip, you can ride in a tuktuk from one end of the town to the other (less costly for a cyclo ride). For shopping excursions in Phnom Penh, take your five dollars to one of the markets (Orrusey, Central, Russian or Olympic) where you’ll be able to buy several items. Small Buddha figures, yards of silk, placemats, wall hangings, bootleg DVDs ($1.50 each), clothing, jewelry, accessories and home goods – all these and more are colorful, unique and cheap gifts to take home (or keep for yourself). The best deal in Phnom Penh for entertainment is Meta House, an open-air rooftop location which screens films at least five nights a week. The films include documentaries, foreign movies and art films and there is no cost (except for special screenings). Food and drink are available for purchase. 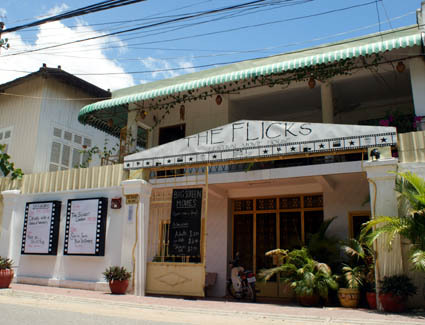 Another cool place for entertainment is The Flicks, an air-conditioned community movie house on Street 95. For $3.50, you can lounge on futons or padded wicker chairs to watch a recent film, an oldie or a documentary (with food and drink for purchase). Friday night is “Happy Friday” where you get a movie, popcorn and drink for $5. 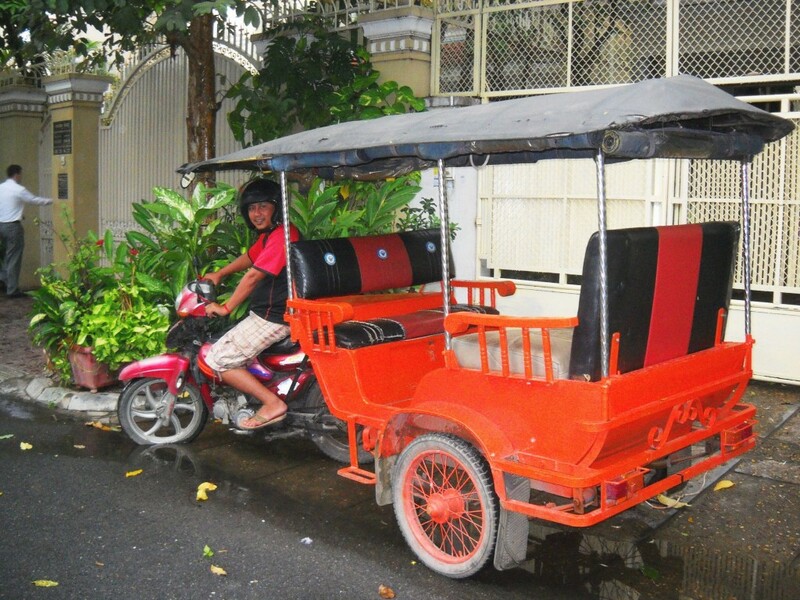 When you want understand a few words of the language or give directions to your confused tuktuk driver, the Khmer School of Language near the Russian Market offers Khmer classes at $4 per hour. If you want to see your $5 disappear fast (or multiply), Naga World is the place to do it. This glitzy casino hotel on the riverfront possesses no less than 700 slot machines and 180 gaming tables. The air-conditioning is wonderful and you can get free soft drinks while you gamble if you want to take a chance with your cash. Rent a bicycle from an outlet near Orussey Market for $4 for the day and explore Phnom Penh’s nooks and crannies as you bump over potholes or play chicken with motos and tuktuks. Even better, take the ferry across the river for 500 riel (12 cents) at the south end of the city (near NagaWorld) for the 15-minute ride to Kandal province where there are endless dirt roads winding past temples and neighborhoods and tiny children who get a thrill from waving and shouting “hello” to passing foreigners. If it’s too hot outside, spend the afternoon or morning on a treadmill or exercycle at Muscle Fitness Center on Street 95. You can buy a pass for $3 which allows you to stay as long as you wish. There’s air-conditioning but, be warned, it is minimal. Or, for $5, go to the Phnom Penh Sports Club where you can use the large swimming pool as well as the gym, sauna, non air-conditioned aerobic room and Jacuzzi. On the topic of swimming pools, there are several pools around town open to the public for a small fee. Villa Langka on Street 282 costs $5 for the day, the Olympic stadium costs less than $2, Elsewhere on Street 278 is $5 and Circa 51 (corner of Streets 222 and 51) is free with the purchase of food or drink. Every night, at the Olympic market and on the river front, you can get in step with one of dozens of aerobic dance workouts being conducted by local Cambodians. All that’s needed is a boombox and a large set of speakers and the class is on! No cost involved but you may want to drop some riel in the collection box. For a good yoga workout, the cheapest classes around are at The Flicks where, for $5 per session, you can join a class at 6:30am or 8am (check schedule for times). And, being in Cambodia means you can get a good massage for your five dollar bill (sometimes with change left over). There are places around offering $2 and $3 massages if you want to take the chance on a cheapie but two of my favorites for $5 are the Miss Care Spa on Street 278 ($5 foot massages before 2pm every day) and the Phnom Penh Sports Club on Street 464. So, make the most of being in Phnom Penh. Treat yourself. Pamper yourself. Dine to your heart’s content. But, if you’re returning to another country, don’t get used to it.